The so-called seventh Natural Wonder of the World is comprised of the Horseshoe Falls, the American Falls and the Bridal Veil Falls. Combined, the falls have the highest flow rate of any waterfall in the world, with a vertical drop of more than 165 feet. But there's so much more to this tourist area than these magical waterfalls. When you visit the town of Niagara Falls, you'll inevitably go to see the actual Falls. It's no wonder. The so-called seventh Natural Wonder of the World is comprised of the Horseshoe Falls, the American Falls and the Bridal Veil Falls. Combined, the falls have the highest flow rate of any waterfall in the world, with a vertical drop of more than 165 feet. The Whirlpool Aero Car, located downstream from the falls, is a cable car that crosses the Niagara River, travelling a one-kilometre round trip over a natural whirlpool. The Butterfly Conservatory on the grounds of the Niagara Parks Botanical Gardens features over 2,000 colourful, tropical butterflies from 45 different species. The Royal Botanical Gardens are 99 acres filled with thousands of perennials, rhododendrons, azaleas and other flowers and vegetables, not to mention a world-famous rose garden featuring over 2,400 roses. If you're feeling romantic, take a horse and carriage ride through the grounds. The Niagara SkyWheel is just one of the many attractions on Clifton Hill, the most famous street in Niagara Falls. You'll find everything from wax museums, midway rides and souvenir shops to themed restaurants and hotels along this commonly named "Street of Fun." Just a five-minute walk from the falls, the Niagara Bird Kingdom is home to a vast array of birds as well as bearded dragons, snakes, tortoises and other creatures. Hershey's Chocolate World is a chocolate lover's paradise. Come hungry. Try the chocolate fudge or chocolate-covered strawberries and wash it all down with a thick Hershey's chocolate shake. The Fallsview Indoor Waterpark, inside the Sheraton on the Falls Hotel, features 16 slides that are up to six stories high, a giant wave pool, adult Jacuzzis and play areas for toddlers. Have your world turned upside down at this attraction. Yes, everything is upside down on the inside as well, so feel free to belt out Lionel Richie's 80s hit "Dancing on the Ceiling" when you visit. Niagara may have its fair of fast food or chain restaurants, but that doesn't mean you can't find fine dining. Check out AG Inspired Cuisine. The Sterling Silver tenderloin of beef tastes as good as it looks. 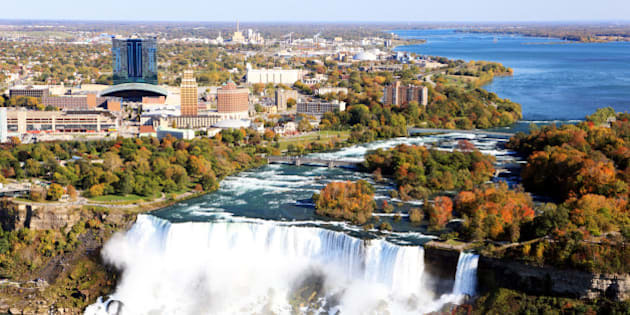 See current Travelzoo.ca Niagara Falls deals here. Andrea Chrysanthou is an editor of the Travelzoo Canada blog and is based in Toronto, Ontario. Travelzoo has 250 deal experts around the world who rigorously research, evaluate and test thousands of deals to find those with true value.